Two topics are discussed in this chapter. First, there is a brief discussion of why patents seem to be attracting so much attention in today’s market. II. 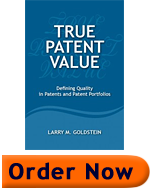 What Creates Sale Value in Patents? Ocean Tomo describes itself as an “intellectual property merchant bank”. Founded in 2003, Ocean Tomo held the first ever public auction of patents in April, 2006. At that auction, only one patent sold for more than $1M. That patent, US 5,133,079, is entitled, “Method and Apparatus for Distribution of Movies”. The patent has a priority date of July 30, 1990, and was issued on July 21, 1992. The patent was purchased for $1.54M (including a 10% sales commission of $140,000) by a company involved in the United States cable television business. This patent focuses on an important technology that covers a market application (that is, downloading movies) of great importance to a major industry, and has an early priority date. Offsetting these advantages, the patent has a few major problems in its method claims, and some other problems, much less serious, in its structure claims. The claim defects might have been avoided with different claim language, or they might have been corrected by applying one or more of the three well-known techniques in the written description, that is, (1) definition of claim terms, (2) examples of claim terms, and (3) claim elements in the patent drawings. The method claims alone might not justify the purchase price paid. However, the purchase price is justifiable by the structure claims in combination with the hot technology area of the patent, the patent’s early priority date, and the broad market coverage of the claims. This is a case in which we might say the quality of the patent high, but the financial value was even higher due to the subject area and priority date of the patent. To Continue to Chapter 6 –Click Here.